This loop takes you around the headwaters basin of Flat Laurel Creek, which starts in a unique, high-elevation valley surrounded by sharp peaks, grassy balds, and cool, dark, spruce-fir forests. 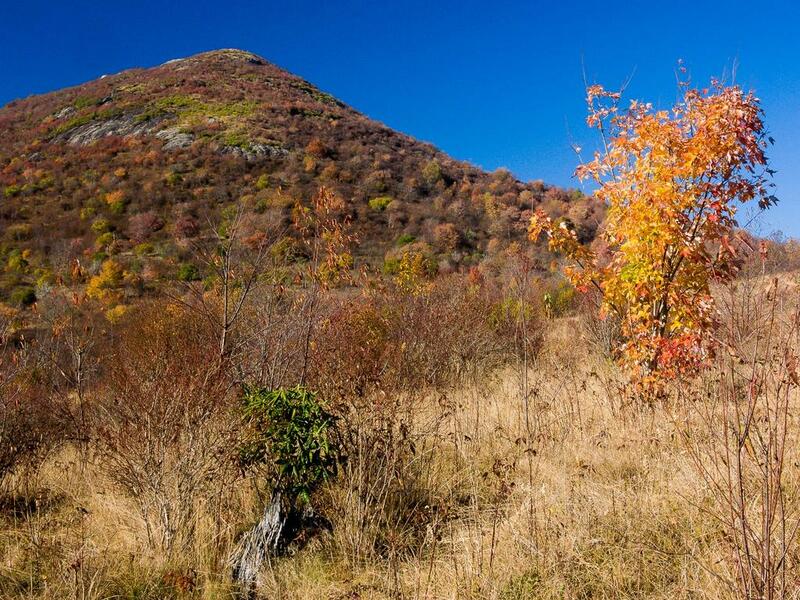 Its elevation is over 5300 ft at the bottom, and it lies below Sam Knob and Black Balsam Knob which top out at over 6200 ft. Includes optional side-hikes to the summit of Sam Knob and a waterfall on Flat Laurel Creek. 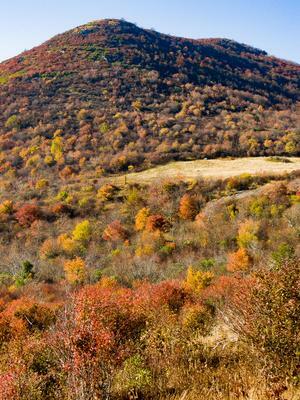 This hike makes a great alternative to the better known, but more crowded, Graveyard Fields area just east of here. 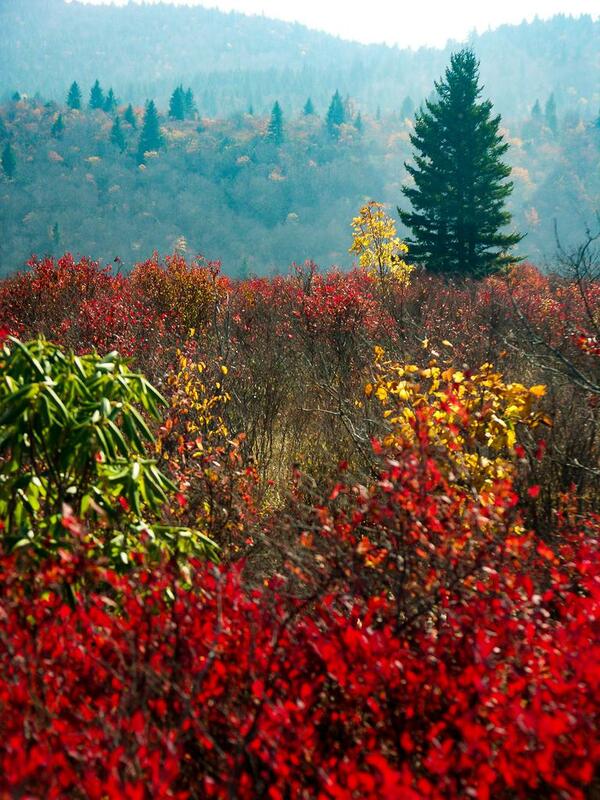 From Asheville, get on the Blue Ridge Parkway heading South. The quickest way to do this is to take I-240 West to I-26 East to Brevard Road (NC 191, exit 33). Turn left at the end of the ramp and follow Brevard Road about 2.4 miles. Turn right at the light at the entrance to the NC Arboretum/Blue Ridge Parkway ramp. Bear left up the ramp and then turn right (South) on the Parkway. 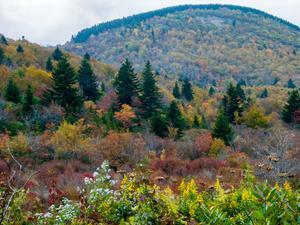 Go 26 1/2 miles (past Graveyard Fields) and turn right on Black Balsam Road. The parking area is at the end of the road after 1.2 miles, on the left. Nearly everyone is familiar with the Graveyard Fields area, located in a high mountain valley beside the Blue Ridge Parkway, and famous for its great scenery and cascading waterfalls. 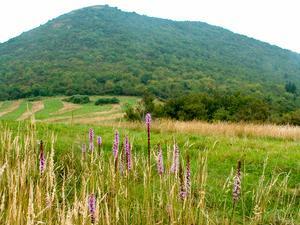 But fewer people are aware of the Flat Laurel Creek valley just to its west. 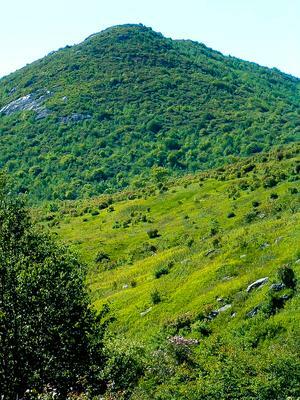 The high, flat, scenic basin makes a great alternative destination when the parking area at Graveyard Fields is full with a great loop hike winding around its rim. Goldenrod and grasses grow under a colorful sunset sky, in the upper Flat Laurel Creek valley during late summer. The hike begins on the same trail as the Sam Knob hike. It's an old road bed that starts just to the right of the pit toilets. It may or may not be signed, but you can't miss it and it's easy to follow. It's level at first, and quickly passes a pretty glade on the left that is brimming with wildflowers, especially during the spring. You'll soon start to descend a bit and the trail gets rocky in places. 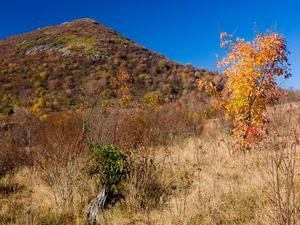 It levels out again, and enters a large, scenic meadow with Sam Knob looming directly in front of you. Cross the meadow to reach an intersection on the other side. 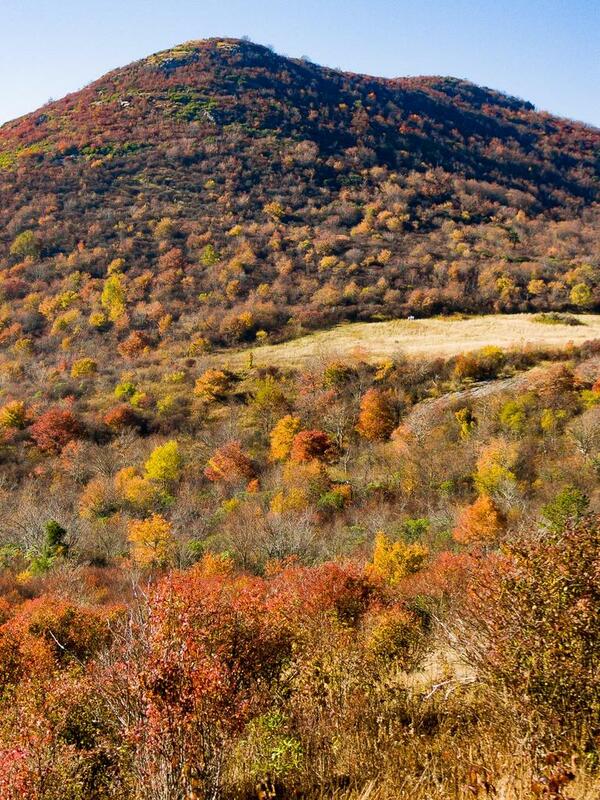 The surrounding mountaintops you see are typical of mountain "balds" found in the southern Appalachians. 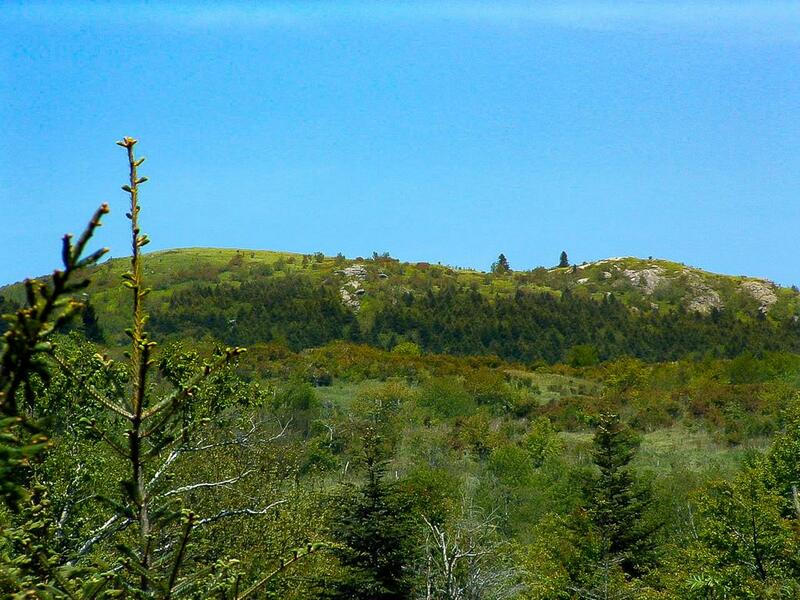 Their grassy summits provide great vistas, and it sometimes even appears as if they have a treeline, although it's not a true one. Trees can grow all the way to the tops of mountains in the southern Appalachians - they'd have to be several thousand feet taller to extend into the true alpine zone. Our hike officially turns left here, following the signs marked "To Flat Laurel Creek". 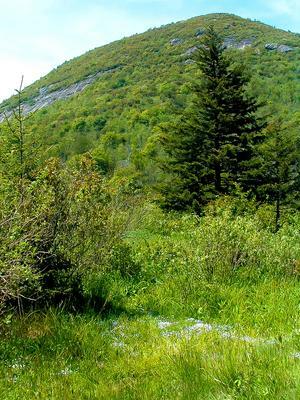 (If you've got the time and energy, you can go right and climb 0.6 mi up to the "bald" summit of Sam Knob for some excellent views, and then return to this point to continue the hike, adding 1.2 mi to the hike overall). 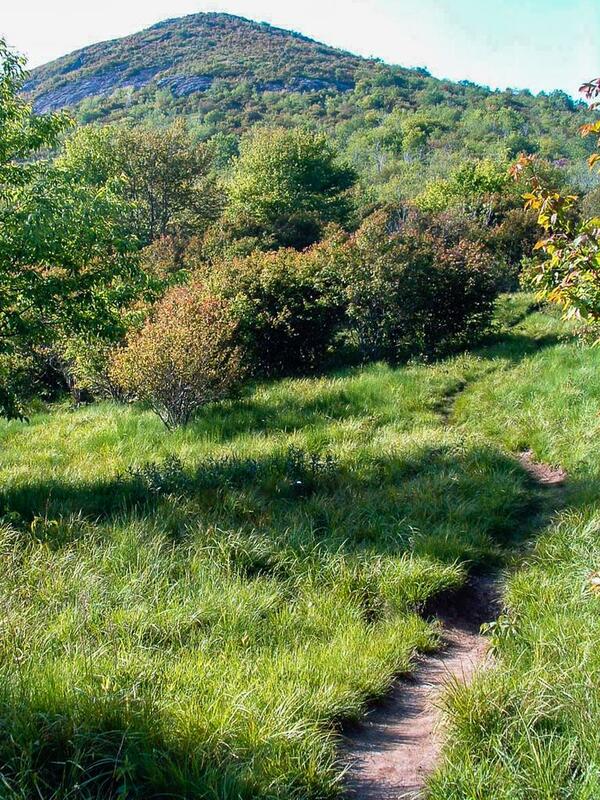 The trail follows the edge of the meadow and begins to descend. Evening light falls across the Sam Knob trail as it winds through the meadows near Flat Laurel Creek, with its namesake mountain looming above. 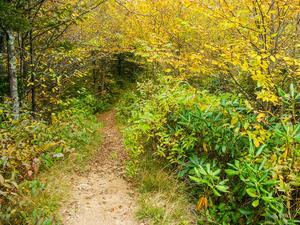 The trail gets narrower and rockier as it travels down the flank of Sam Knob. 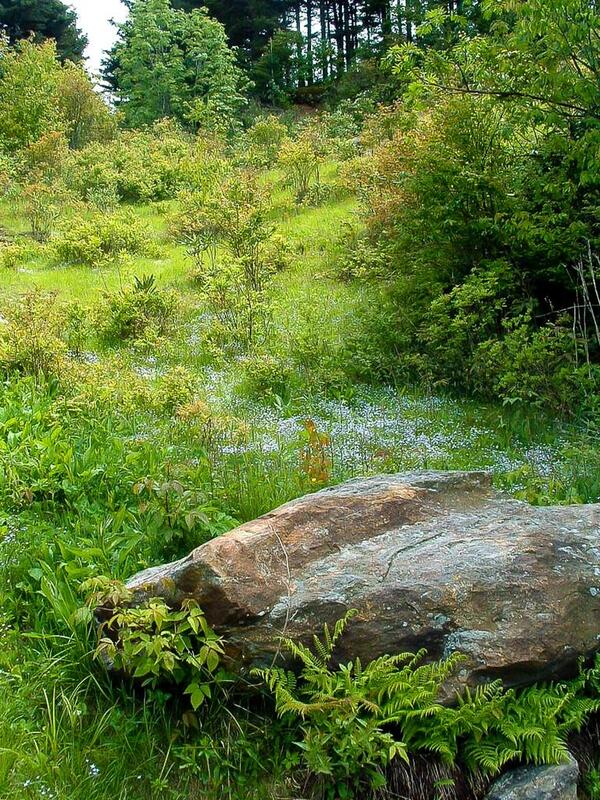 It's not very steep overall, but there are some rocky and eroded sections, and some sections can stay wet and muddy. 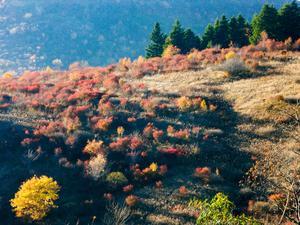 You'll be passing through meadows, various shrubs, short trees, and blueberry bushes the size of small trees. If you visit in mid to late August, you'll be able to snack on the ripe, sweet fruit along the way! Naturally, this entire area would be covered by a dense, dark spruce-fir forest similar to what you can see on the slope across the valley from you. However, extensive logging which took place around the turn of the century, followed by devastating fires, has resulted in the sparsely-vegetated forest you see now. 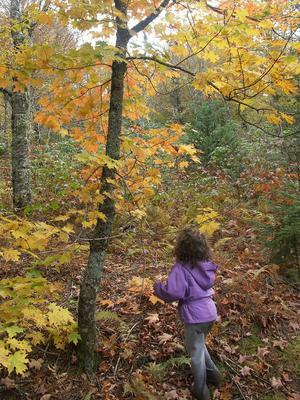 The trees are making a comeback, though, and it's possible that the area may once again be covered in forests if given enough time without disturbance. Nevertheless, it's a beautiful area and it's appealing since it isn't as densely forested as most of the mountains in the region. The trail will cross a small creek and then emerge into a small meadow; this area makes a great campsite and it is fairly heavily used as such. 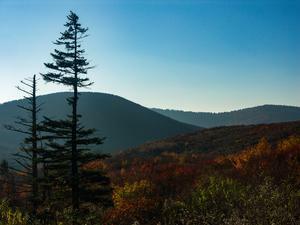 There are some neat views back up to Sam Knob. 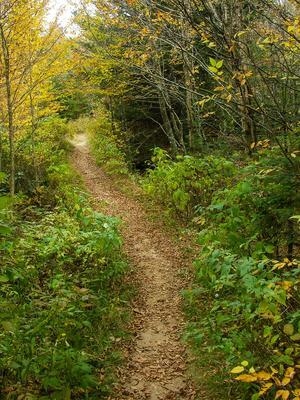 A trail joins from the left; this is the old Sam Knob trail which goes up to the parking area but its use is not encouraged anymore. 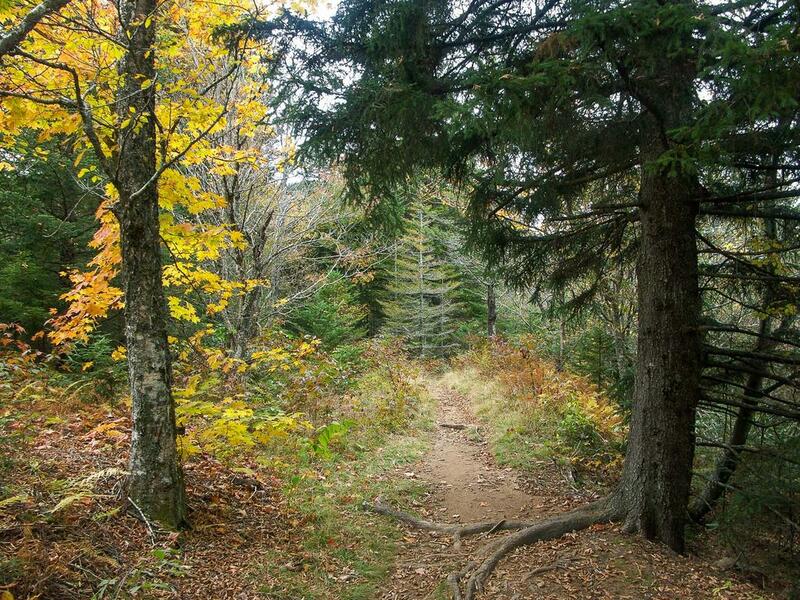 Bear right and you'll pass through a bog where it's hard not to get your feet muddy. (A re-route of the trail is planned in this area). Look for frogs or their eggs in the small pond to the left of the trail. 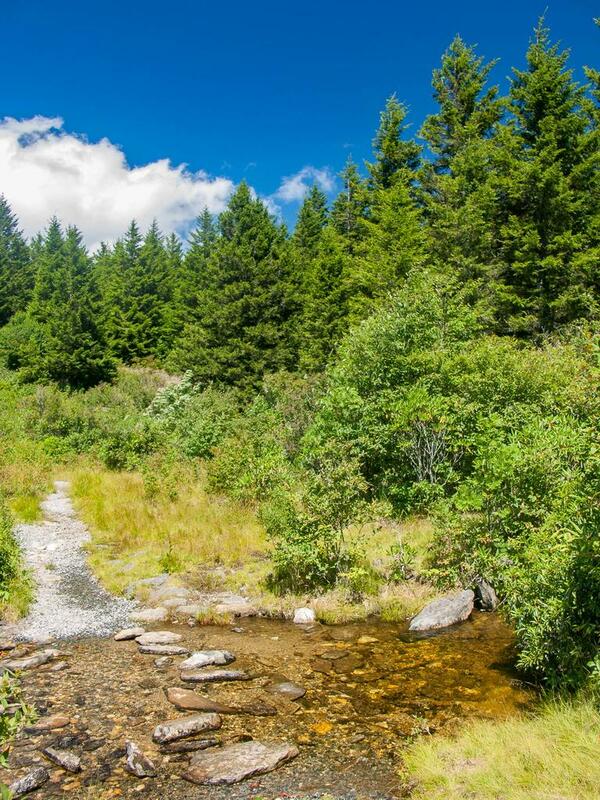 Past the bog, you'll enter a stand of rhododendron before coming to some steps, leading down to a rocky crossing of the larger Flat Laurel Creek. 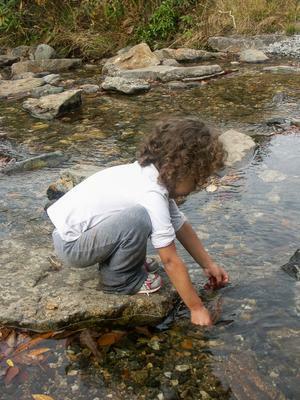 You can carefully rock-hop the creek here and keep your feet dry, if the water is average or low. During very high water, it might be a tricky (if not impossible) crossing. A small, sliding cascade is just downstream of the crossing. Immediately after crossing the creek you'll join the wide, well-used Flat Laurel Creek trail. The parking area is to your left and that's the way our hike continues. (It might be worth a detour to your right for 1/4 mile and a steep scramble down the slope to reach a larger waterfall on Flat Laurel Creek, and then returning to this point, adding 1/2 mile to the hike overall). The setting sun falls behind a spruce tree in the upper end of the Flat Laurel Creek valley. 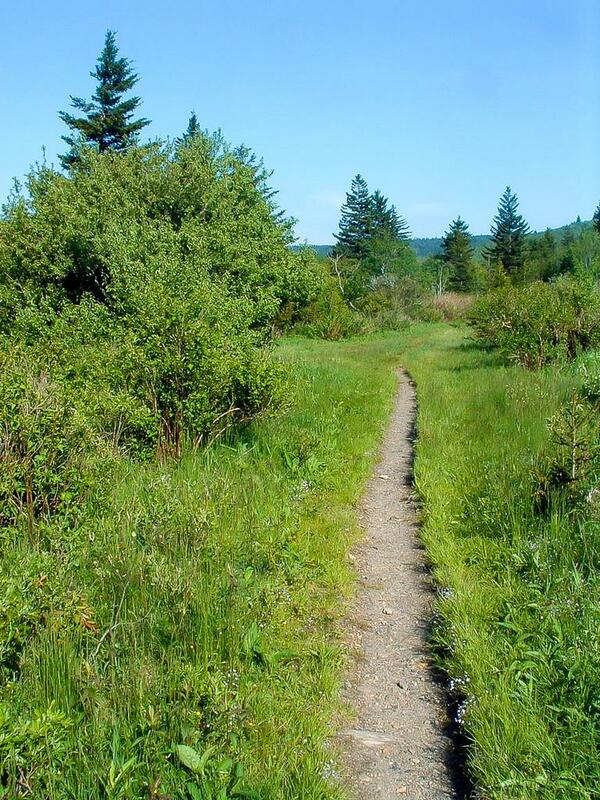 The Flat Laurel Creek trail follows an old railroad bed. This railroad line once stretched all the way from the logging camp known as Sunburst far below, to the Shining Rock Wilderness far ahead. Due to its flat cross-section and lack of grade reversals, the trail has historically been known for being extremely rocky and wet; however, a tremendous amount of work has been done on it recently reducing this to a minor level. Since trains can't climb very steep grades, the trail is a gentle climb the whole way. 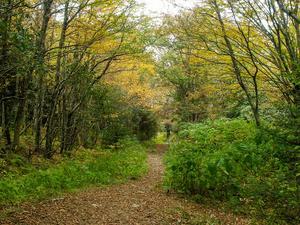 At this point you'll be traveling through a mixed forest of birch and evergreens; there is one particularly scenic, open section of birch woods along this stretch which vaguely remind me of Aspen forests in the Rockies. 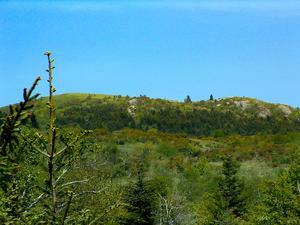 A neat, grassy ridge can be seen to the left. Several small streams or seeps cross the trail and you'll cross one larger stream - one of the headwaters branches of Flat Laurel Creek - on large stepping stones. Maple near the trailhead in fall color. If you're interested in forest ecology, pay attention and you might notice that there are several very large, mature Fraser firs that still grow here, some of the largest I've found still surviving in the region. It's not clear what keeps individuals like this alive despite Adelgid attacks, but it gives hope that maybe some resistant trees will repopulate the forests with their seeds. 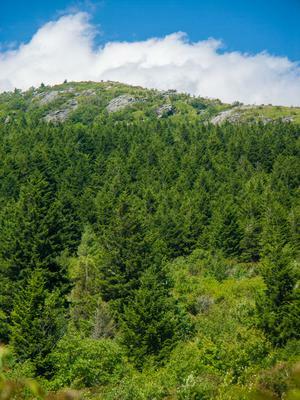 (Hemlocks - which grow mostly at lower elevations and are also being attacked and killed by another kind of adelgid - may not be so lucky. I've not heard of any individual trees showing any meaningful resistance to the bugs). Soon you'll emerge from the denser forest and start making a wide 90-degree left hand curve. 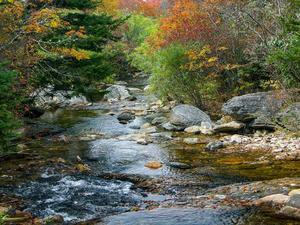 The trail crosses another creek, then it begins traversing above the scenic meadows at the headwaters of the stream. 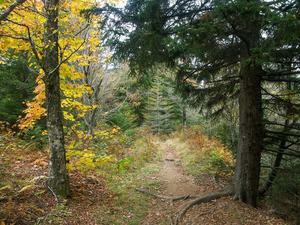 A dense Red Spruce forest is to your right; these trees appear to have been planted due to their even age and spacing. It's also possible that the railroad bed stopped some of the fires as they swept up the valley. To your left are open views back toward Sam Knob and the valley opening between it and Little Sam Knob. 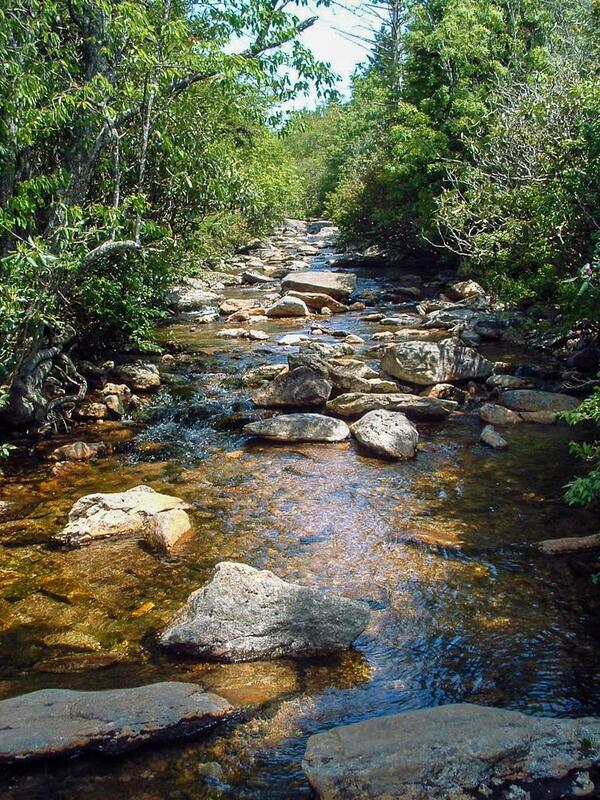 You'll cross a couple more seeps and headwaters branches. 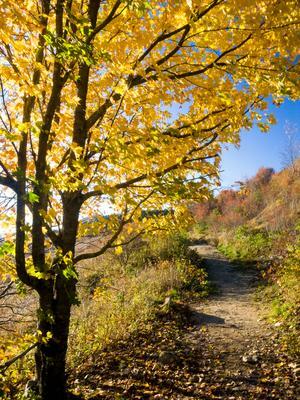 You'll be able to see (and hear people in) the parking lot long before you reach it and the trail emerges at the back of the lot where your vehicle is parked without much fanfare to end the hike. 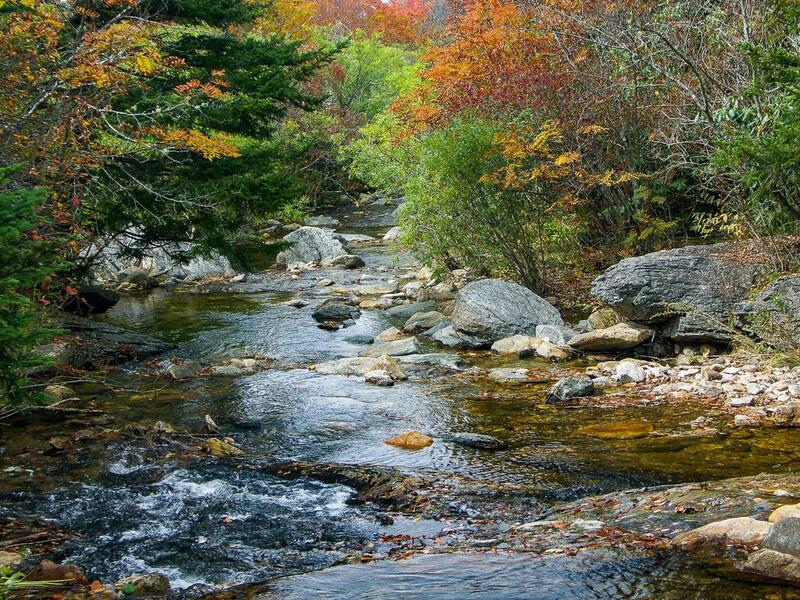 Lori Howard said: Our very favorite hike in the spring and fall! Lori Howard said: Hiking this wonderful trail is an annual event for my husband and me! Joy Canup said: What is the closest tent campground? 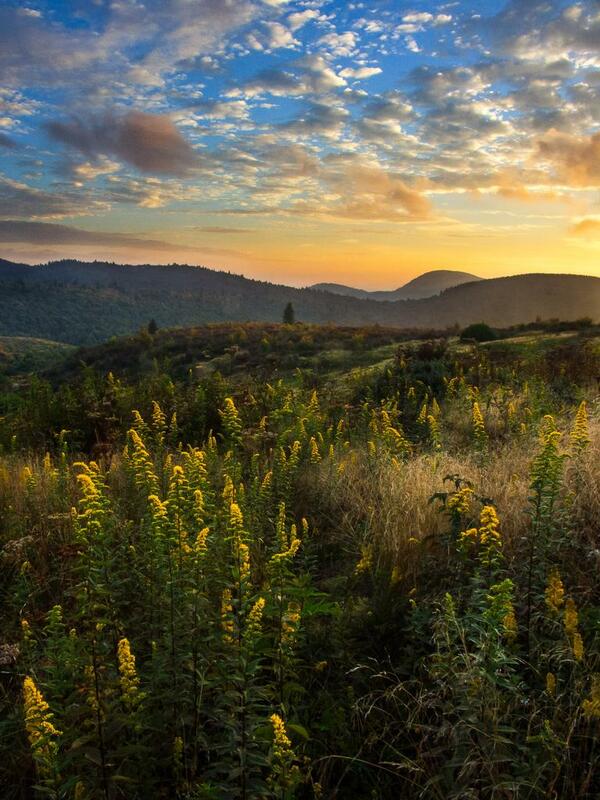 Amanda Long said: best time to hike this trail for the wildflowers? Jordan M. said: Yes - there is limited parking at NC 215 (and plenty more up and down the highway a bit from the trailhead). To keep it easy I didn't describe it that way, but a hike up Flat Laurel Creek and then doing this loop is indeed a good one and can be done year-round! sean said: Is there parking at hwy 215? I would like to start at 215, do this loop, and return. Is that possible? Jana said: Cliff, Yes - the trail follows Flat Laurel Creek all the way to Hwy 215. 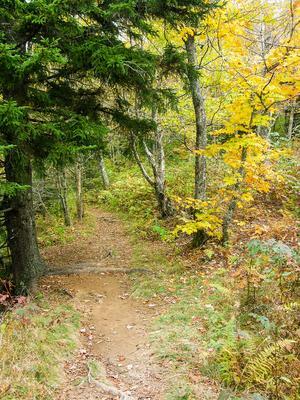 The loop described here does not incorporate the entire trail known at Flat Laurel Creek - only a section of it plus parts of the Sam Knob trail to form a loop. I recommend hiking the full trail along Flat Laurel Creek - it's really beautiful and includes a waterfall with a concrete bridge over it. Jordan M. said: It continues in some form or fashion all the way down, but it gets gnarly and overgrown in places. You'll lose the trail more often than not - consider this one to be a strenuous, off-trail trek. But there are a handful of nice cascades along the way. cliff said: I've been down the Rhodo-tunnel scramble trail a few times to get to the falls/cascades on Flat Laurel Creek. I have a question...it appears that this unofficial trail continues on downstream well below the cascades. Can anyone comment as to whether this "trail" follows the creek all the way to 215?